Tacos are pretty much one of the best foods. Ever. Need something quick for dinner? 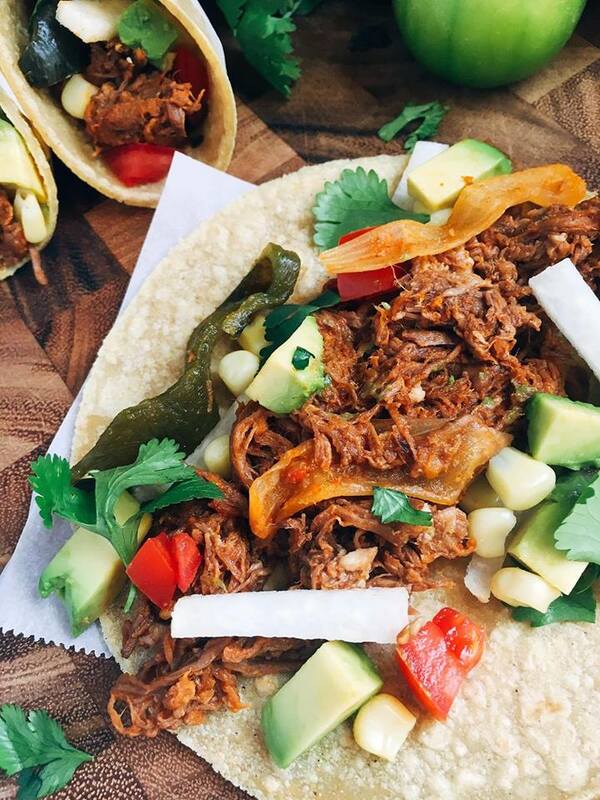 These Slow Cooker Shredded Beef Barbacoa Tacos are perfect! 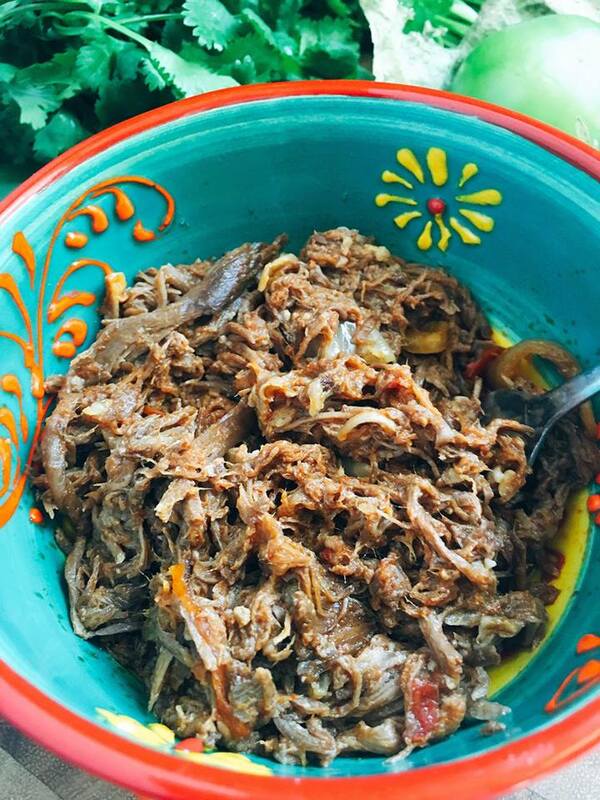 Barbacoa is a meat such as beef that has been slow cooked with some spices and seasoning, then shredded. I love using this shredded beef for tacos, but it is also fantastic in enchiladas or quesadillas. You could even make it into a Mexican salad! 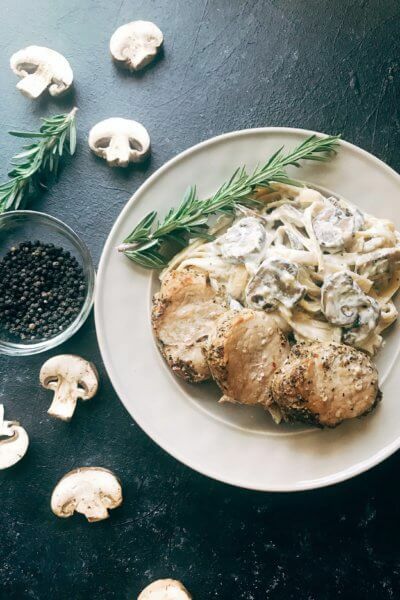 Slow cookers are the perfect tool to make delicious, home-made meals during the week and when you just don't have the time or energy to deal with it when you get home. 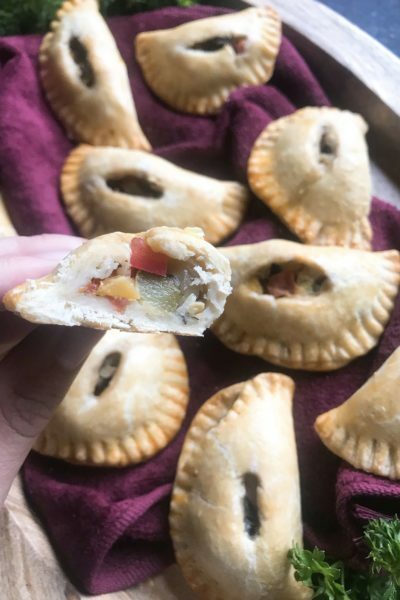 I am particular about any kitchen gadgets or tools as not all of them are worth it, but (affiliate) these slow cooker liners are the most amazing things ever! Just line your crock pot with one before you throw everything in, and then toss it out when you are done for an easy clean up! No caked on gunk! I am not sure how I ever lived without these! Shredding meat can take forever plus my hands always start cramping from all that fork shredding. A better way to do it? Throw all your meat when it is done cooking into a stand mixed with the paddle blade and turn on medium speed for just a few seconds. Instant shredding! No hand cramping! Check out our Roasted Poblano Salsa Verde Enchiladas here which use the same technique! 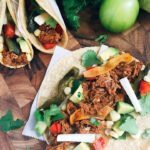 There are so many toppings that you can put on these glorious Slow Cooker Shredded Beef Barbacoa Tacos. I love roasted peppers, fresh salsas, and jicama. 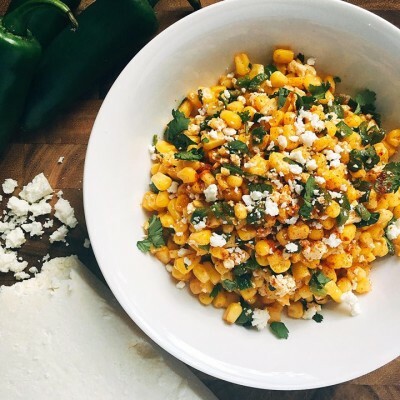 Check out some of our other recipes below that would be perfect taco toppers! What are your favorite things to put on a taco? The quantity will depend on how much meat you put in each taco. A moderate amount of 1/3 cup per taco will give you approximately 12 tacos for a 2 lb roast. Prep the slow cooker with a liner for easy clean up (see note). Place the beef inside the lined slow cooker. Add the remaining ingredients into the slow cooker. Add water to the slow cooker until the beef is completely covered. Place the lid on the slow cooker and cook on low for at least six hours. When done cooking, remove the beef from the slow cooker. Trim off any excess fat and place the meat into the bowl of a stand mixer with a paddle attachment. Turn on medium speed to shred the beef, which will only take a few seconds. Add some onions and juice from the slow cooker to the bowl and mix in with the beef using a spoon. You need slow cooker liners in your life! Disposable liners that make clean up so incredibly easy! Find them here! Chuck roasts will vary in size. Most of the time I end up with one around 3 pounds, so just adjust the rest of the ingredients as needed to be proportional to the size of the roast. These tacos look amazing! I love Mexican food and could eat it every day! Thanks for the recipe! The tacos look so delicious and mouth watering that i could do with one right now. Any recipe that I can start in the slow cooker is my friend. We have tacos once a week usually. Kim, I love the flavors in this beef dish. I am a big Mexican fan and the spices are so good. I love tacos!! I have had jicama salad but I’ve never used it in tacos before!! Looks amazing!! Great post! Slow cookers (and pressure cookers) are such great tools for weeknight cooking. I love barbacoa tacos, and the flavors look spot on. Nice tip for shredding the pork too! We have tacos weekly! This looks like a great way to change things up! 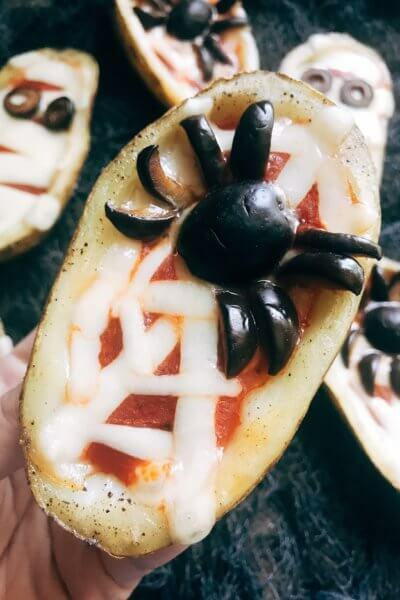 Oh my goodness, these look amazing! And a slow cooker meal at that. I can definitely do this! My husband is going to love these 😉 Pinning to share! 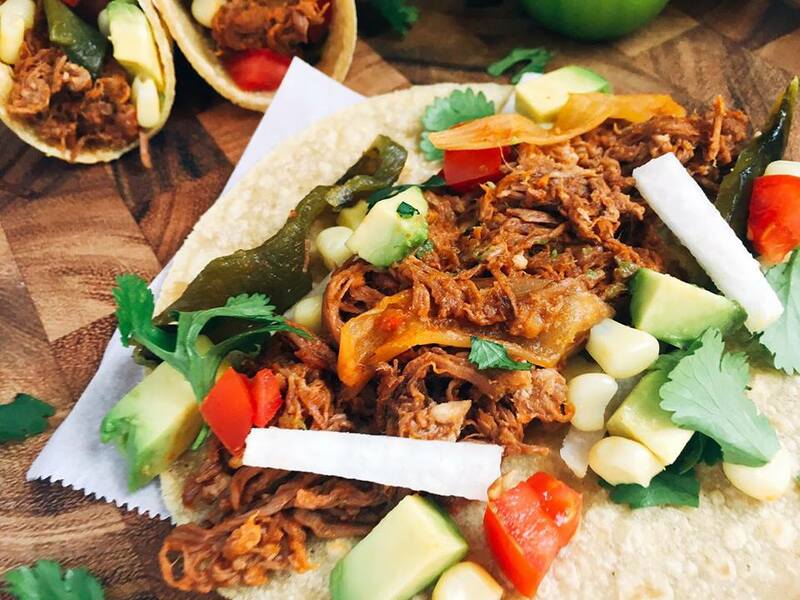 These tacos look amazing and I love that you make them in a slow cooker! Coriander is my new fave spice lately, pinned! 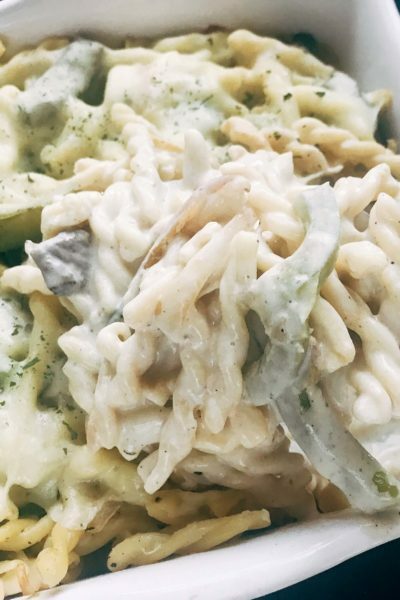 Your food always looks SO good! Pinned! I love using my slow cooker for these kinds of dishes. Looks really, really good. This looks amazing and so simple to make. I’m definitely pinning this recipe to make later. Thanks for sharing. What I love about this post is that you stressed how much you need to use slow cooker liners! They really are a life saver. Great recipe as well. YUM! 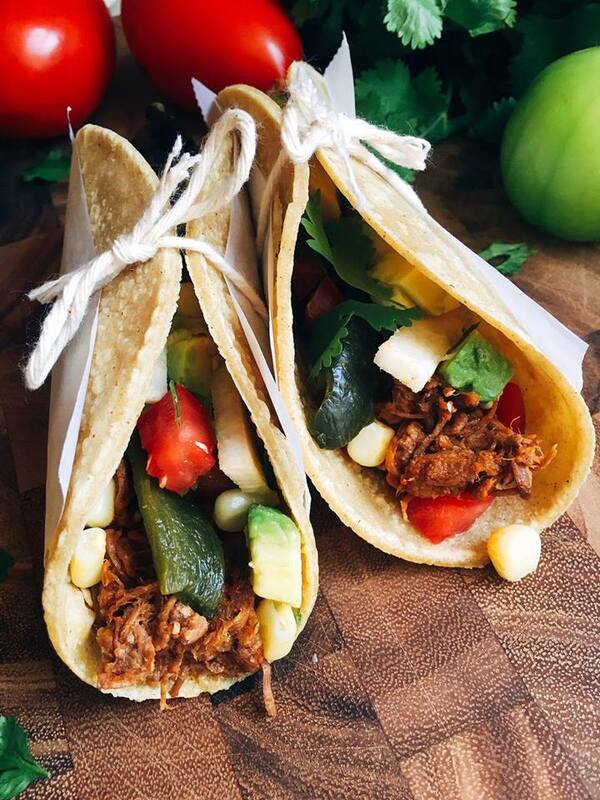 I LOVE barbacoa – especially in a taco! 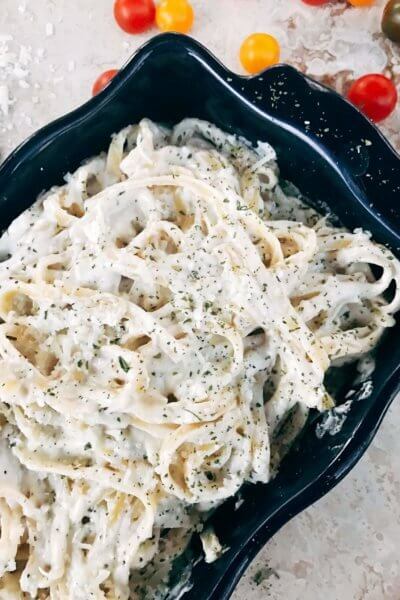 This recipe looks perfect. I can’t wait to try it! I’ve never thought about shredding beef in a mixer, that’s such a great idea! These tacos look amazing! These look great! And aren’t slow cooker liners great? They make clean up so easy!! The slow cooker liners are a great idea! And the tacos look awesome- can’t wait to try.